The Most User Requested Apps Have Arrived on Hootsuite!! 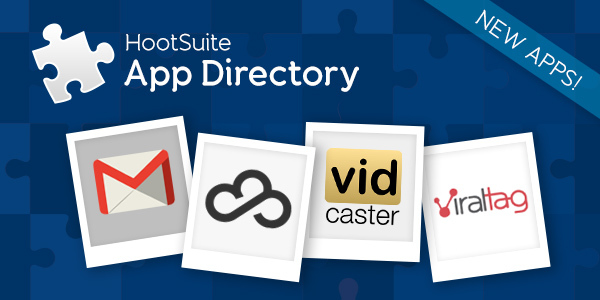 The HootSuite App Directory announces the addition of four new apps designed to help streamline communications and increase productivity. Users have asked and we’ve delivered; the new Gmail and ViralTag for Pinterest apps represent our dedication to create a platform that caters to user needs. With over 13,000 votes submitted to the HootSuite Feedback Forums, these highly requested apps have arrived in the HootSuite App Directory. Along with these much anticipated apps, we also introduce two new marketing apps, Vidcaster and Shopseen, that will help enhance your social marketing. For some people, getting updated could mean switching between Twitter, Facebook, and other tabs just to see their latest feeds. 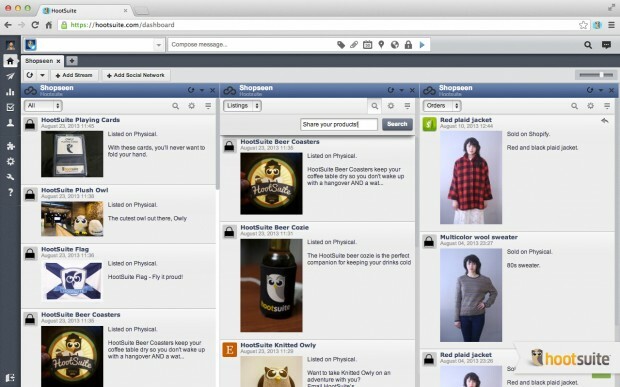 With the HootSuite dashboard, we put all your social networks into one view and now, emails as well! Read, write and respond to emails from your gmail accounts directly in the dashboard. Click to enlarge. 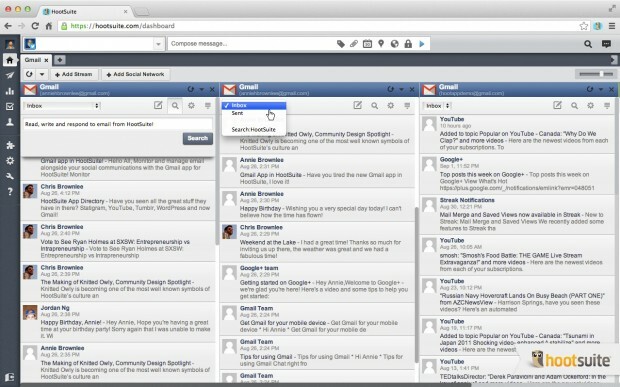 The Gmail app for HootSuite allows you to monitor all of your points of communication within one central dashboard. Never again will you have to take your eyes off another video on your Facebook feed for an urgent email. Simply tilt your vision a little to the side and you can multitask with optimal efficiency. You have the ability to read, reply, and delete emails from the dashboard. So if you’ve been too busy tweeting up a storm on Twitter, you can now give your overloaded inbox some much needed attention alongside your social media. Try the new Gmail app now and you’ll achieve inbox zero in no time. The ViralTag for Pinterest app allows you to schedule new pins right from the HootSuite dashboard. Have you ever wondered how some users on Pinterest gained their large fanbase? The key is to actively engage followers with new content. Now you can do that without manually pinning a new photo every hour. The new ViralTag for Pinterest app in HootSuite will allow users to easily schedule, share and analyze their pins on the dashboard. When a clothing brand wants to introduce a new season of garments, this could mean several photos to share with their followers. To keep the momentum, users can choose to schedule photos periodically so that viewers aren’t visually overwhelmed by a single blast of updates. So how can you further promote your content? Brands and companies can now share their pins across all the social networks in HootSuite to push promotions for greater reach. Try the new ViralTag for Pinterest app. In an interactive age, photos are not enough to tell a story. The use of video has become more prevalent in social media engagement. 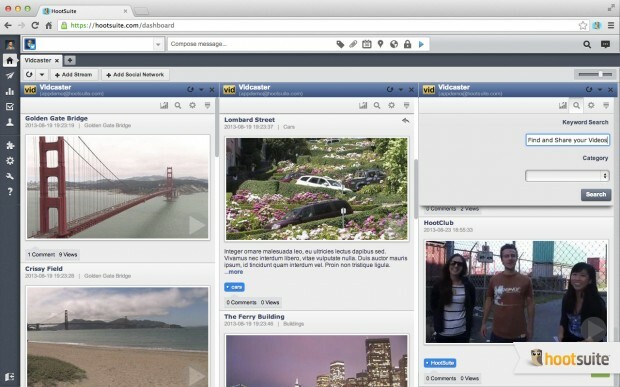 You can now easily distribute your Vidcaster videos across all your social networks in the HootSuite dashboard. With the Vidcaster App, a social media manager can not only view and share videos, but access analytics to track engagement and viewership. Vidcaster provides you with the data to create videos that appeal most to your audience. Discover when your viewers drop off your videos and which videos are gaining the most attention. Improve the content you share with your followers. Install the Vidcaster App now. The more people that see an item for sale, the more likely and quickly that item will be sold. Whether you run an online store or just want to get rid of some old clothes, it’s no surprise you’ve posted your items on multiple sites like eBay, Shopify and Etsy. But how do you keep track of all your listings? The new Shopseen app lets you monitor all your listings in one stream in the HootSuite dashboard. You can keep track of inventory and orders, so you know when your hot items are running low. While often the issue for store owners is the lack of traffic to their listings. Using the Shopseen app, you can increase visibility by promoting your listings across all the social networks in HootSuite with one post. Generate more revenue and expand your reach, try out the new Shopseen app. Did you know that our App Directory has 65 apps that help enhance your brand presence and enrich your social experience? Check them out today.